West Lafayette, Indiana to be Mid-Century Modernized 5/28/09 - 5/30/09. 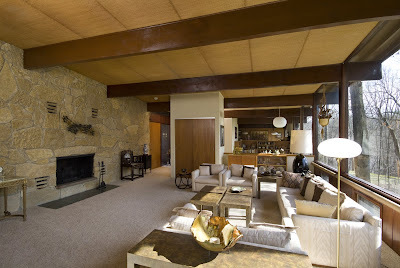 Historic Landmarks Foundation of Indiana has planned a Mid Century Modern feast. Bring your appetite. No worries for non-locals. Atomic Indy here to ensure you get fed too. We will be live Tweeting impressions and pics as we go. Like any good party, weekend kicks-off 6:30PM, Thursday (5/28/09) at IMA with an illustrated lecture on the Case Study Houses presented by Elizabeth Smith, Chief Curator at Chicago’s Museum of Contemporary Art. Lecture is free. RSVP to Facebook event invite for free lecture here. 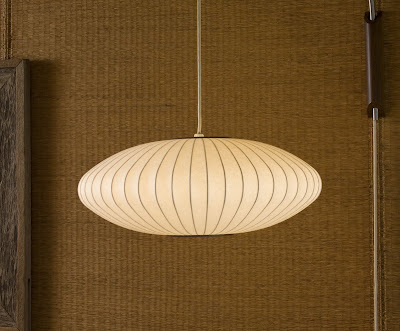 Friday is for recovery from Mid-Century Modern Case Study House hangovers. Saturday (5/30/09) culminates into rave-style MCM festivities. Bring your glow sticks. Tickets are $12 per person in advance; $15 day-of-tour. Maps will be available at each tour home and a shuttle will circulate among the sites. Ticket holders may drive on their own among the homes or park and ride a shuttle that departs from Redeemer Lutheran Church, 510 Lindberg Avenue. Maps, restrooms and refreshments will be available at the church. RSVP to Facebook event invite for tour here. Crafty slide show courtesy of Indy Star. Read their article about the tour here. Hope this tour facilitates in-person introductions. 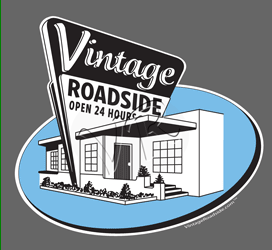 To ensure I'm easily found, will be wearing this sweet T-shirt from my good friends at Vintage Roadside. They make T's from authentic vintage advertising signs. That's just cool. Find me. Say hello. We'll chat like old friends. Can't wait. This post will hold until above events have past. 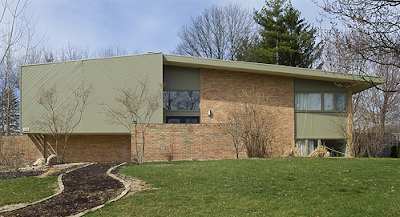 This will serve as a beacon to those in search of Mid-Century Modern fellowship in Indiana. Tell your friends. We'll be here when you come back home. As for the tour, tune into the Twitter feed. 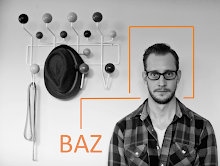 I will be following your tour online, Baz. 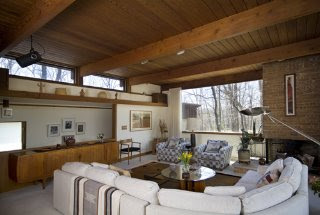 Love the pics of the Frank Lloyd Wright Usonian house. 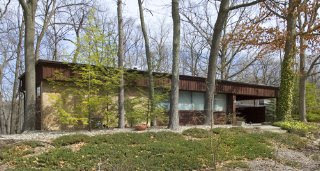 Many years ago, I walked through a Usonian house at the Art Institute of Chicago, assembled in their garden area. They had actually taken the house on tour, assembling it at each site. Wish I could hit the road this weekend!